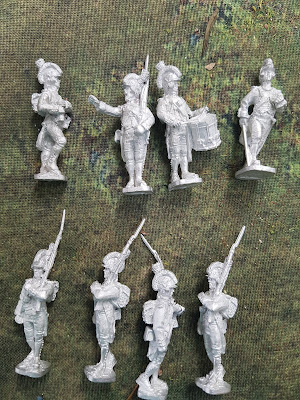 I picked these up at Partizan on Sunday from Revolutionary Armies' recent Kickstarter, and very nice they are too. French regulars for the early years of the Revolution, 'Les Blancs'. They have also done regulars in bicorns, grenadiers, and have great plans for the future. I now just need to get them painted, all six battalions! Never heard of RA but the figures look nice. New company linked to Three Armies Minis. Nice looking figures - and the early Revolutionary Wars have always looked like a great period to game - such variety of uniforms, head gear etc! they weren't Graham but are linked with Emperor Toads Emporium. Three Armies etc? Nice figs Colin, a good find! Can’t say I’m overly impressed with these, but then I have no need of or use for them, so that probably helps.